(MyHSR Corp) announced that the Kuala Lumpur-Singapore High Speed Rail (KL-SG HSR) project received overwhelming support from the state of Johor. 99% of respondents in Johor have provided positive feedback on the project via the Public Inspection exercise which began on 1st November 2017. 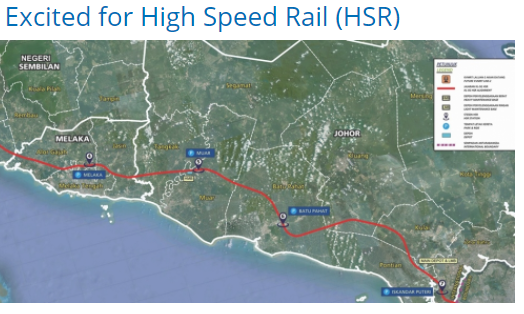 Johor will have the longest HSR alignment with 182 km out of the total estimated alignment length of 328 km in Malaysia, with three stations located in Muar, Batu Pahat and Iskandar Puteri. In addition, Johor will be home to two major maintenance facilities for the project, with a main depot located at the north of Iskandar Puteri Station for all HSR trains maintenance and a heavy maintenance base to be located near the Muar station responsible for maintenance of the HSR track, power supply and signalling system. Both maintenance facilities are expected to drive employment opportunities in the coming future as new skills and talents at various levels are required to operate these facilities.